Wishlist Club, Rome. 6th October, 2017.
Review written by Karl-Göran Karlsson. I had the pleasure to visit a minor rock festival in Rome arranged by Dark Veil Productions on Friday 6th of October in Rome. The event took place at a small venue called the Wishlist Club, a place obviously offering concerts with musicians and bands coming from very different musical territories. I want to already now state that I found the venue perfect for a gig like this. It allowed a very nice contact with the bands playing, bar services were perfect, sound was held at decent volume levels (!) and the ventilation was superb. The audience was probably slightly below 200 people but the concert hall felt like full anyhow. The arrangers Dark Veil Productions consist of two enthusiastic creative women; Simona Rongione and Floriana Ausili, and this was their second gig since the start of their project. 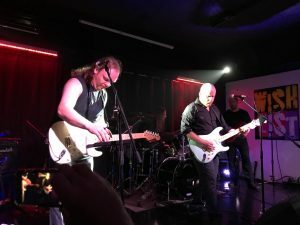 The first one took place earlier this summer in Rome with no others than the two Cavanagh brothers (Vincent and Daniel) from Anathema who played an outdoor gig entitled “Anathema Acoustic”. This was a success and gathered a crowd of about 500 people in the audience. 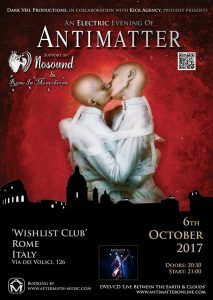 This second gig had the English band Antimatter as its headliner supported by Nosound and Rome in monochrome. 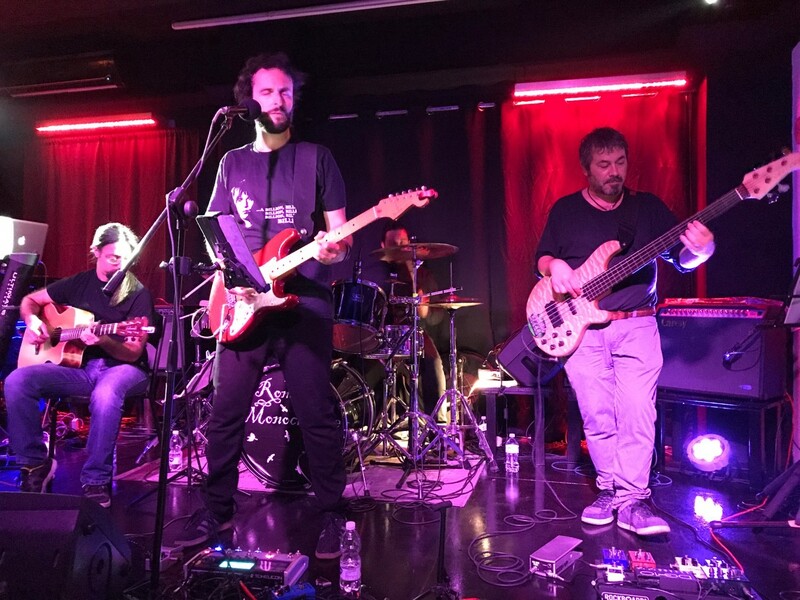 The show was entitled “An Electric Evening with Antimatter” which can be understood by the fact that the band played a completely acoustic gig in Rome back in 2012. So now they were back again with a fully electric show as a rock band. The gig was advertised by a somewhat provocative poster showing two persons (men?) kissing intensively but if looking more closely one could see that they were actually wearing straitjackets forcing them to stay together. Another odd feature is that their faces appear to be attached to each other like Siamese twins. The theme is taken from the latest album of the band entitled “The Judas Table”. There are also other interesting circumstances about this gig. Those who have read the intriguing book “Angels and Demons” by the famous author Dan Brown know that antimatter and Rome are important themes of that book. You can also notice the contours of some famous buildings in Rome on the poster. First band in line Rome in monochrome (name strangely linked (?) to Antimatter’s ‘hit’ “Monochrome”) played a handful of songs as a starter of the evening. The style of their music is described as inspired by drone or doom metal. Anyway, the band played guitar-dominated rock with rather low tempo and a fair singer but he had some problems with the lower tone register. Quite OK but I got the feeling that they were not really used to play a lot live. Next act was the anticipated peak of the evening (I am a recent fan) when Nosound entered the stage. 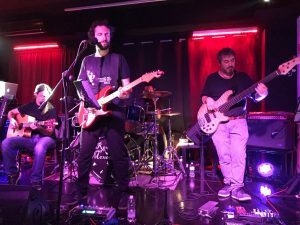 The band is led by Giancarlo Erra, born in Rome but now living in England since 8 years. They have produced several good albums since their debut in 2005 with the album “Sol29”. The band got Italian Progressive Music awards for their two albums “A sense of loss” (2008) and “Lightdark” (2009) and personally I think that their very latest album “Scintilla” is one of the top Progressive Rock albums of 2017. Their style is very warm and emotional and there is often a slow, soft flow in the music full of harmonies and ambient sounds. Inspiration is obviously coming from bands such as Pink Floyd, Porcupine Tree, No-man and Brian Eno. The singing style of Giancarlo is also very special. He speaks or recites more than he sings sometimes, as if he really wants to tell us a story (and he does). Nevertheless, I very much like his warm and soft voice and his style of composing. The band played 5-6 songs from their most recent albums and I recognized most of them even if one or two were also new to me. Unfortunately, without having access to the final setlist I cannot give more details here. Nevertheless, it was very enjoyable to listen to and the performance was indeed very close to the versions of the songs played on their albums. I already look forward to seeing them another time as headliner somewhere and sometime (welcome to Sweden!!). The evening’s Headliner Antimatter gave an almost 2-hour long show introducing the set with the “Monochrome” hit, a song that in the recorded version makes you think of electropop bands like Depeche Mode from the 80’s. But here this version sounded heavier and quite guitar dominated. The band was back in Rome after almost 5 years since their acoustic gig here in 2012. But it was now the electric version of the band with a heavy and tight rock sound (but nevertheless supported by some background taped keyboard passages). They have played more than 300 gigs now and one could surely see that they knew exactly what to do. However, band leader Mick Moss admitted after the gig that he will now take a years’ break from touring since he felt quite worn out after all the touring. This evening’s gig was well-played and it was clear that the four members had found a tight sound together. Guitar-dominated, sometimes at slow pace and sometimes with higher pace and intensity. Mick’s lead sing is OK but he doesn’t seem to be a natural singer. His vibrato is kind of strange and could perhaps be something you either love or hate. I found songs a bit monotonic and similar in their style but I must confess that I haven’t listened much to them before the gig which always helps for the appreciation of concerts. The band played however a very nice and unusual version of Pink Floyd’s “Welcome to the machine”. The response from the audience was good but nevertheless not totally enthusiastic. For example, encores were made without much noise to trigger them. All musicians played well and the lead guitarist showed some unusual techniques with using a gadget with some flashing blue light instead of using his fingers in some solos. I found this strange but I guess it would not be completely unknown for experienced guitar freaks to figure out what it was. 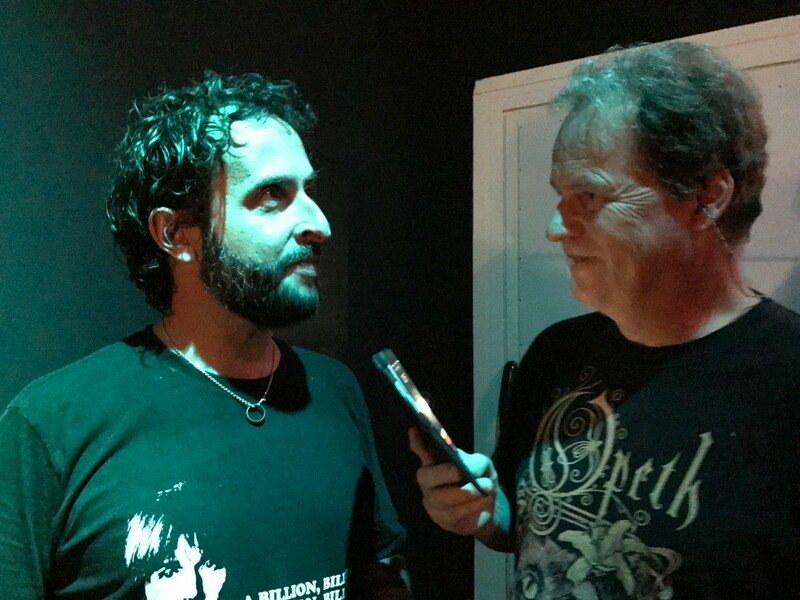 After the gig I got the opportunity to talk for a while with Giancarlo. He told me that the band is currently on a limited tour in Italy but that this gig was actually not planned at all until very recently. 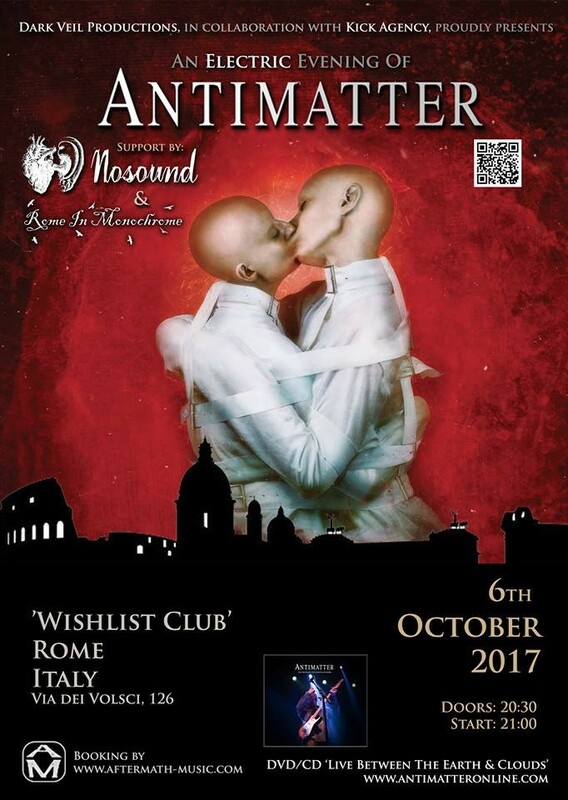 They had already played some gigs in Rome and in some other places in Italy during the last month but when the offer came to return to Rome for this very special gig it wasn’t at all difficult to accept it. He and his band are obviously much appreciated in Rome. On the question if touring will continue he said that he hopes to be able to tour more intensively next year. A new album is also on its way and the next 4-5 months will be occupied with recording sessions. Then follows touring for the remainder of 2018 and he mentioned that he would love to play also in Scandinavia. He has not played before in Sweden but he has been on a recording mission somewhere in the Swedish forests (as he expressed it) in a project together with Tim Bowness. If I have understood that correctly, it must have been the short-lived constellation Memories of Machines formed by Tim and Giancarlo back in 2006. It resulted in the release of the album named “Warm Winter” later in 2011, including also contributions from many well-known prog musicians like Steven Wilson, Jim Matheos, Peter Hamill and Robert Fripp! He mentioned also specifically his wish to play at the BeProg festival in Barcelona next year (I personally hope that the band will also show up at events such as Night of the Prog – chances appear quite good!). On the question of musicians which have inspired him he confirmed my suspicion that Steven Wilson and early Porcupine Tree where among those (the band actually played together with No-Man for a couple of concerts some years ago) but also other bands which are not directly into Prog (like Sigur Ros and Radiohead) were mentioned. A bit surprising was that he didn’t know much of other prog bands in Italy like The Watch and others even if he faintly recalls that maybe they played together with The Watch in some Polish festival some years ago (probably 5th Artrock festival in Konin 2011). All in all, we had a very enjoyable evening at the Wishlist Club in Rome. Thank you, Simona and Floriana, for your hospitality and enthusiasm and good luck in the future!